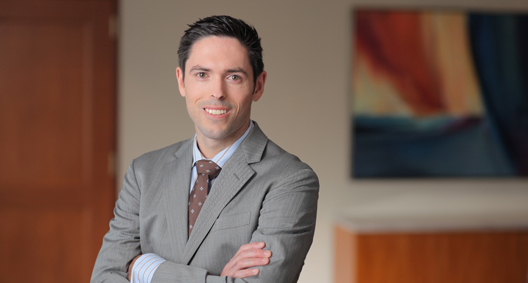 Dustin Dow focuses his practice on nationwide class actions, employment representation and insurance coverage. With comprehensive litigation experience, Dustin manages clients' needs throughout the litigation process, from pre-discovery to appeals. On insurance matters, Dustin counsels both policyholders and insurance carriers, providing practical insight to guide resolution of cutting edge, complex coverage disputes. Drawing on his background as a journalist, Dustin aggressively uncovers the facts of the matters facing his clients and provides timely, clear answers and recommendations to help them effectively achieve their goals. As the editor of the firm's annual class action review, Dustin is continually abreast of the most recent and relevant trends affecting companies dealing with potential class action liability. An advocate for arts in education, Dustin is the Board Chairperson of the Center for Arts-Inspired Learning, and is a member of the City Club of Cleveland. Regularly handles wage and hour collective actions arising under the Fair Labor Standards Act. In a recent case against leading janitorial company, successfully opposed conditional certification, leading to favorable early resolution of the lawsuit before a class was certified. Represented and provided coverage analysis to a mutual insurance company with respect to various claims made by policyholders sued for alleged violations of the Telephone Consumer Protection Act. Represented company facing class-action ERISA denial of benefits claims, achieving Rule 12 dismissal based on aggressive defensive approach. Represented and defended a company responsible for the placement and operation of red light traffic cameras in various class action litigations and appeals challenging the use of the cameras. Class action lawsuits were filed in Cleveland, Chicago, New York and Florida. Represented a leading manufacturer of parts for the aerospace industry and an executive employee against a suit for permanent injunctive relief under the theory of inevitable disclosure of trade secrets, resulting in a favorable judgment on the merits and denial of injunctive relief. Handles representation of railroad industry employers in Railway Labor Act and Federal Railroad Safety Act lawsuits and appeals. Campbell-Ewald Company v. Gomez, 136 S. Ct. 663 (Jan. 20, 2016), (Amicus Brief concerning use of offer of judgment in Telephone Consumer Protection Act case). Tyson Foods, Inc. v. Bouaphakeo, 136 S. Ct. 1036, 2016 WL 1092414 (March 22, 2016), (Amicus Brief dealing with use of statistics for determining liability and damages and inclusion of uninjured class members in a class action under Rule 23 or a collective action under the Fair Labor Standards Act). Standard Fire v. Knowles, 133 S. Ct. 1345, (2013) (Amicus Brief in Class Action Fairness Act case).